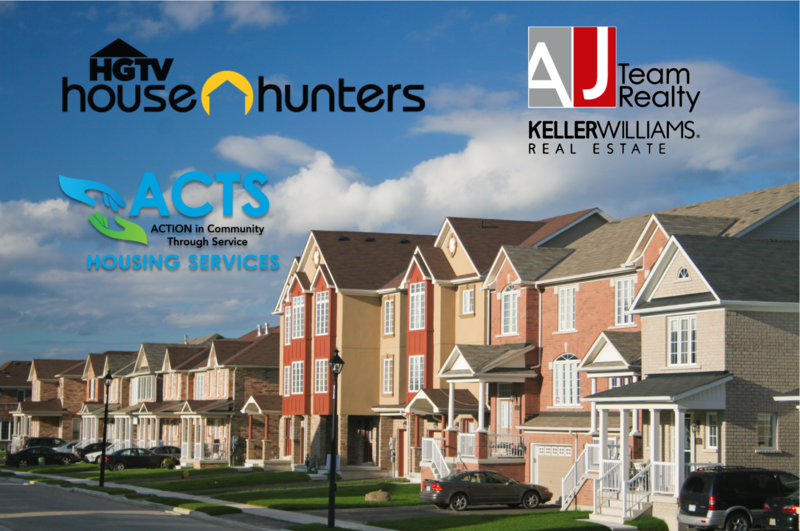 AJ Team of Keller Williams Realty, recently featured on an episode of HGTV’s popular show House Hunters, announced viewers helped raise $1,000 for ACTS Emergency Family Shelter in Dumfries, VA. Because one of the team’s Core Values is to “Be A Blessing”, they donated $1 for every social media post viewers tagged to the team’s Facebook or Instagram pages during the 22-minute live show. On July 20th, the AJ Team will present the check to shelter representatives at their office located in Lake Ridge, VA. The journey which led the AJ Team to HGTV began when CEO Allen Johnson met Makya and Delmar through a network of friends. The couple had almost given up on finding their dream home after a year-long search because they were frustrated with their previous realtor and the home-search process. Johnson convinced them to give his team a chance, and fellow AJ Team Realtor Sam Eligwe spearheaded the efforts to find the perfect home for their growing family. Due to AJ team’s proactive approach, Makya and Delmar found their forever home and were under contract in just 12 hours! “The last time I worked with a realtor to purchase a home, I had a horrible experience. I carried this level of disdain for realtors into my initial meeting … Fortunately, Sam not only understood my concerns, but wasn't offended by my skepticism and took it as a challenge. He fought for the things my family wanted and exceeded our expectations – he even closed the deal within 12 hours of our initial offer! … [The] team worked magically to creatively make sure we got the most out of our deal as possible. I'd recommend [the] AJ Team to anyone in the market to buy or sell a home. They take GREAT pride in what they do…,” Makya said after the show was filmed. There are so many ways we can use the money, but for the Beverly Warren Shelter specifically, our aim is to create a warm environment for our residents during their stay. Providing internet, for example, allows our clients to look for jobs, while the phone service we provide allows them to keep in contact with job makers, friends, and family. Our Housing Program’s focus is on sustainable housing initiatives to help people find affordable housing. The funds can also be used to help pay for deposits and first month’s rent. ACTS has sheltered 18 families - 31 adults and 43 children - this year in their Beverly Warren Shelter and have helped 37 families into permanent housing, including 35 adults and 54 children. If you would like to support ACTS' Emergency Shelter, we are one of six local charities who have been nominated to receive an additional $5,000 from the AJ Team Realty. They will be giving away $5,000 to the charity with the most votes by the time they close on their 100th house of the year. As of yesterday, they were at 97. With a one in six chance of winning $5,000, we are asking everyone to vote every day and share this opportunity with all of your friends on Facebook. Please start sharing this link with your family, friends, co-workers, staff members, & volunteers so they can start voting for ACTS TODAY!!! People can cast one vote per day, so please encourage them to vote, vote, vote!! !